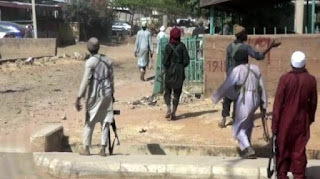 Boko Haram insurgents are currently burning houses in Gatamwarwa ward, Chibok local government area of Borno state, petfadblog.com reports. The insurgents came in around 5pm through Askira, shooting sporadically leaving many villagers running for safety. “They came in tens of motorcycles. They started shooting and setting houses ablaze,” a resident told TheCable. Gatamwarwa is about 19 kilometres away from Chibok town. Sources told TheCable that troops from 117 battalion in Chibok and 115 battalion in Askira have moved in to repel the attack. In December, the insurgents attacked Makalama, another village in Gatamawarwa ward. Bwalakia villagers were also attacked three days after the Makalama attack, burning houses and leaving villagers stranded.